A specter is haunting the British Labour Party — the specter of Trotskyism. All the powers of the old party leadership have entered into a holy alliance to exorcise this specter: deputy leaders and general secretaries, Blairites and Brownites, the soft left and the hard right. This echo of the Communist Manifesto would have been a fitting opening to deputy Labour Party leader Tom Watson’s own manifesto about leftist infiltration of the party. Right now, as the party goes through its second leadership campaign in a year, Watson and other opponents claim that Jeremy Corbyn’s base swarms with Trotskyists who have entered the Labour Party to bore from within. Their paranoia has been fed by an unprecedented rise in party membership. At the time of the last general election in May 2015 it stood at around two hundred thousand. That number has now jumped to more than half a million, including more than 125,000 in the two weeks following the European Union referendum. The British Labour Party is now the largest left-of-center party in Europe. Watson only recently presented Corbyn with a dossier meant to prove his claims of Trotskyist infiltration. Corbyn’s campaign team responded that Watson should stop peddling conspiracy theories. But British newspapers have taken up Watson’s line and run with it. Is there anything to the story? Trotskyism’s use as a political swear-word in Britain peaked in the 1980s, with Leon Trotsky long since buried and the Labour Party very much out of power. In the first few years of that decade the Left and Right of the party fought for control, and the Right won. Senior Labour members of parliament (MPs), including party leaders Michael Foot (1980–83) and Neil Kinnock (1984–1992), came to think that the main obstacle to their recovery of a parliamentary majority were the left-wing “entryists,” Trotskyists who joined the Labour Party en masse since the 1960s. The most famous of those groups was the Militant Tendency. Militant achieved a majority among the membership of the Liverpool District Labour Party in 1982, and in 1983 they won a majority on the Liverpool City Council. The council then went into open battle with the central government. They opposed rent rises for council houses, and borrowed money in defiance of Thatcher’s policy to cap rates increases in order to build new housing and clear some of the worst slums that disfigured the city. This program won them a good deal of local support. It did not, however, endear them to Neil Kinnock and the Labour leadership. A purge followed. The leadership proscribed Militant as an illegal party within a party. They hauled members or suspected members of Militant before the National Executive Committee to face possible expulsion. Hundreds, maybe thousands of Labour Party members were ostracized in this way. Some entire local Labour Party branches, including the Liverpool District Labour Party, were dissolved and replaced with “loyal” ones. Many non-Trotskyist figures on the Left tried in vain to stop the purges, including then-junior MP Jeremy Corbyn. Kinnock’s stand against the Trotskyist scourge won him plaudits from the right-wing press. Yet the tabloids that celebrated his purge in 1985 did not extend the same courtesy to him during the 1987 and 1992 general elections, both of which he lost. Having managed to enfeeble his own left wing, Kinnock never propelled the right and the center into power. The Trotskyist scare faded away after the 1980s. Neil Kinnock finally resigned in 1992, and after his successor, John Smith, died in 1994, the way was clear for Tony Blair and Gordon Brown to finish the job that their predecessors had started and push the Left to the fringes of British politics. After Blair and Brown came Ed Miliband in 2010. “Red Ed,” as the right-wing newspapers called him, was not much of a revolutionary. But he did make one change that would pave the way for Jeremy Corbyn. Miliband abandoned the existing system for choosing the party leader, which since the 1980s had accorded nearly equal voting rights to the MPs, the trade unions, and the party members, and replaced it with an open primary. The right and center of the party thought that this change would further reduce the influence of the trade unions and guarantee that future Labour leaders would be elected from their faction. They forgot about the Law of Unintended Consequences. Tony Blair advised Labour supporters who sympathized with Corbyn’s message to “get a heart transplant.” Peter Mandelson, adviser and PR man to Blair and Kinnock, publicly called for Corbyn’s three opponents in the race to drop out so that they could frame the election as illegitimate. Those contenders briefed against each other to the press in the hope that the other two would drop out and leave one to battle Corbyn alone. The anti-Corbynistas called this mythical “unity” candidate ABC — Anyone But Corbyn. But none of the three could agree on who that Anyone should be. Corbyn won 60 percent of the vote and became party leader. The ground was laid for Labour’s current civil war. Corbyn’s supporters created a new organization, Momentum, to capitalize on his unexpected success and consolidate the Left’s position within the party. The Right, meanwhile, decided to go underground. With characteristic modesty they compared their coming struggle against Corbyn with the French resistance during the World War II. Some of their faction would oppose Corbyn from the outside, which anonymous briefers to the right-wing Daily Telegraph called the “Free French” strategy. Others, following a “Maquis” strategy, would accept jobs in Corbyn’s ministerial team and wait for the right time to strike. Through this combination of pressure from within and without, the majority of Labour MPs hoped to undo the leadership election and take back “their party” from its members. Since his election, Corbyn’s opponents in Parliament and the press predicted that each test of Labour’s electoral strength would lead to his fall. In the December 2015 Oldham by-election and the May 2016 local elections, virtually every major media outlet predicted electoral disaster for Labour. When those did not come to pass, you could hear the sound of a hundred journalists all jamming the backspace button, deleting pre-prepared stories of Corbyn on his way out. The vote to leave the European Union finally gave the Labour right their chance to strike. Corbyn campaigned for Remain, but there were rumblings that he was a reluctant and unenthusiastic advocate for the cause, even a closet Leaver. All hell broke loose the day after the Leave victory. Even as Prime Minister David Cameron resigned, and Conservatives looked like they might turn on each other, Labour MPs moved against Corbyn. They initiated a vote of no confidence in their leader. Nearly fifty parliamentarians abandoned their shadow cabinet posts over the next few days. Many of them posted long, self-justifying letters of resignation on social media. When the no-confidence motion came to a vote, 172 Labour MPs favored it. Forty remained loyal to their leader. It seemed as if Jeremy Corbyn’s stint as party leader had come to an end. Almost the whole spectrum of newspaper opinion, from Guardian liberals to the reactionaries of the Daily Mail and the Sun, had already decided that he should go — now they thought the moment had finally come. But Corbyn and his supporters hung on, and insisted that only the party members who had voted for them could vote them out. A new leadership campaign, only ten months after the last one, began in July. Corbyn’s original challenger, Angela Eagle, pulled out after the party establishment flagged up her support for the Iraq War as a major problem. A little-known Welsh MP, Owen Smith, stepped forward to act as the “ABC” candidate. After Watson failed to broker a deal with the unions to have Corbyn step down, he openly defected to the opposition. The party’s National Executive Committee prevented more than one hundred thousand new party members from voting in the leadership election, and went to court to defend that decision. The Labour civil war entered a new phase. As it did, the ghostly figure of a goateed, bespectacled revolutionary reappeared on the front lines. Everything was ready for Tom Watson’s anti-Trotskyist manifesto. On August 10, 2016, the Labour Party deputy leader wrote a public letter to his leader about what he called “the increase in members of proscribed organisations attempting to join the party.” He asked Corbyn to confirm whether he still agreed that members of proscribed groups, such as Militant (now known as the Socialist Party), should remain ineligible for membership in the Labour Party. Watson ended his letter with a document, supposedly distributed widely among far-left members who had infiltrated Momentum. It detailed plans to take over local branches of the Labour Party by making branch meetings so boring and confrontational that the other members would stop attending and leave the left-wing rump to pass unanimous resolutions unchallenged. This document came from a book on Militant, written in the 1980s by the journalist Michael Crick and republished in 2016 — with an endorsement on the cover from Tom Watson. The dossier went one better. Making use of publicly available statements and websites, Watson alleged that three Trotskyist groups — Workers’ Power, Labour Party Marxists, and the Alliance for Workers’ Liberty — were trying to infiltrate local Momentum groups and use them to take over party branches. Once achieved, they would demand the mandatory reselection of MPs, or in other words to have local party branches select the Labour candidate for their seat before every election, rather than select that candidate only when the sitting MP resigned or was defeated at the polls. 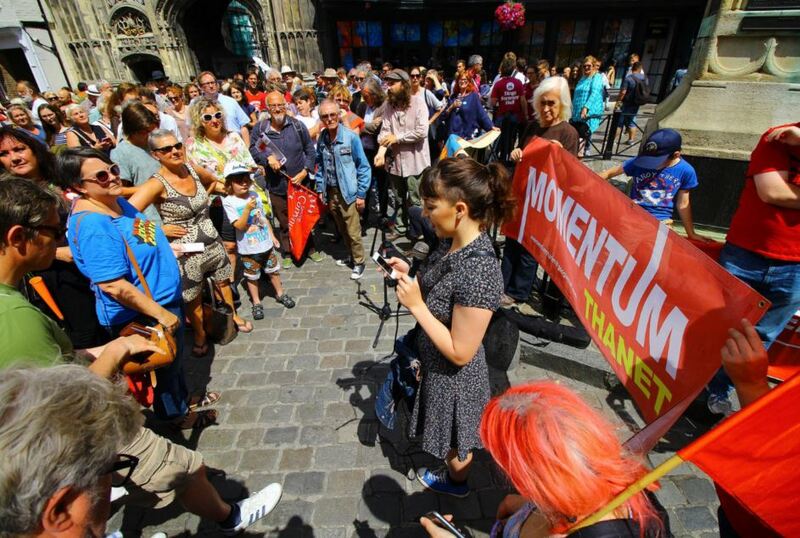 Reselection has always been a demand of the Left to make MPs more accountable to the members — and a threat to MPs from the right and center of the party, who fear that such a measure will leave them at the mercy of local left-wing activists. There is no surer way to raise the blood pressure of Labour parliamentarians to the point of coronary failure. These are the allegations on which the new hysteria about Trotskyist infiltration is based. But what it would mean if every one of Watson’s implications were true? The numbers are revealing. The largest two groups mentioned in the dossier, the Socialist Party and Socialist Workers Party, have a few thousand members each. The four other groups mentioned each represent several hundred at most. Add these all up, throw in a few extra thousand ex-members or sympathizers, and you have about ten thousand committed Trotskyists in all. That number is a simple refutation of Labour Party apparatchiks who paint Corbyn as the product of a Trotskyist conspiracy. Double or triple that ten thousand figure and it would represent less than a tenth of the jump in Labour Party membership since the last general election. And even that comparison is misleading, because the Socialist Party and Socialist Workers Party have very much not joined Labour or encouraged their members to do so. Perhaps a handful of members have ignored them, but a large organized Trotskyist bloc within the party does not exist. Watson, of course, would rightly reply that this is not what he is saying, even if that is the implication that most media outlets have tried to plant in the minds of their customers. He claims that the conspiracy is to be found in the support and coordination that links Trotskyists with Momentum and other Corbyn supporters, and convicts all of them of breaking Labour Party rules. These charges are easy to substantiate on a very small scale. Several smaller groups described above have almost certainly entered the Labour Party and helped with Corbyn’s election campaigns. Momentum has organized some pro-Corbyn events with the Socialist Party. The Socialist Workers Party undoubtedly hopes to recruit members among active Corbyn supporters. Most people on the Left, inside and outside the Labour Party, support mandatory reselection. All that Watson has proved is that supporters of Corbyn who are Labour members will often work with Corbyn supporters who are not, and that those two groups share things in common. This should not come as a shock to anyone. But there is a larger question here. Given the small numbers involved, why are senior Labour figures going to such lengths to prove to the public that Trotskyists have infiltrated their party? Watson’s claims give the newspapers fresh ammunition to use against Corbyn. The leader’s enemies can use his fall in the polls as another weapon to use against him in the leadership election. People will be encouraged to think that Momentum is Militant, and Owen Smith is the Neil Kinnock that can return Labour to power. These comparisons require a certain reimagining of the 1980s in which Militant were Satan and Kinnock actually won an election as Labour leader. But that is, as it happens, the historical memory that drives many of Corbyn’s opponents and remains the consensus of most TV, radio, and newspaper coverage. Truly, the 1980s still weigh like a nightmare on the brains of the living. If Corbyn remains its leader we can expect perpetual challenges and coups against him from Watson and most Labour MPs. They might think of themselves as Maquis or Free French, but their wild claims of Trotskyism evoke instead the atmosphere of a seedy show trial where all the failings of the leaders are pinned on a giant conspiracy of saboteurs that exists nowhere except in the minds of the accusers. Watson’s manifesto, like the campaign waged by leading Democrats against Bernie Sanders, certainly gives us an idea of the lengths that these figures can go to when they feel that their rule is threatened. This should not worry us. The fact that they feel that way is a sign of the opportunities now open to the Left in Britain, the United States, and around the world.